In the tourist use regulations of the Inca Trail network of the Historic Sanctuary of Machu Picchu, they are Norman. annual authorizations so that travel agencies can operate, on the Inca Trail. Tierras Vivas, respectful of the norms of our country, approved the qualification of the requirements established in the Regulation of Tourist use. Tierras Vivas, complied with presenting the required documents, by the pertinent entities (SERNANP, DIRCETUR, Regional Directorate of Culture), as well as, by means of pertinent documentation, not having had any administrative sanction, for infringement against the Natural and Cultural Heritage, as well as in the use of the Inca Trail. Then, that the headquarters of the Historic Sanctuary of Machu Picchu, authenticate the documentation presented. Tierras Vivas, obtained, its annual authorization to operate on the Inca Trail, and any excursion to the whole of Peru. The Service of Protected Natural Areas SERNANP, granted us, the permit to operate the Inca Trail Machu Picchu, on January 15, 2015. 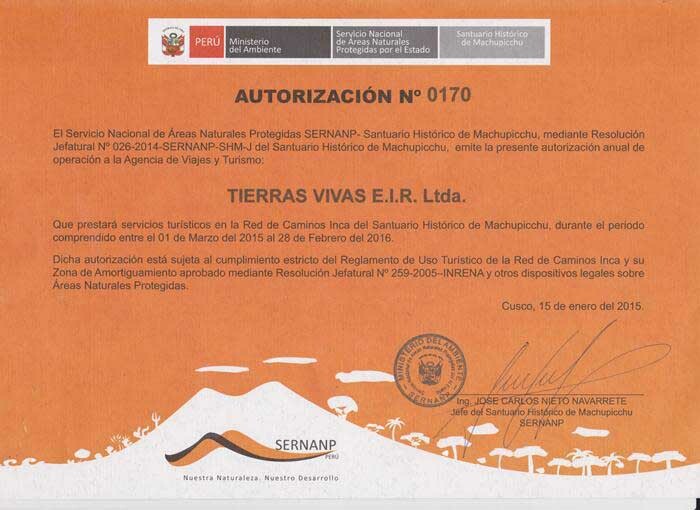 Tierras Vivas have the authorization to operating on the Inca Trail and all alternative treks to Machu Picchu such Salkantay trek Peru, Inca Trail Tour to Llactapata, Putucusi Trek, Inca Jungle Trek, Lares Trek, Cachiccata Trek, Vilcabamba Trek and Choquequirao to Machu Picchu. Tierras Vivas is a one of the premier tour operators in Peru. It is specialises in small groups, family holidays, luxury travel, adventure trekking and tailor made travel to suit your personal requirements.